S.W. Basics of Brooklyn makes its all-natural skincare and beauty products from scratch because company founder Adina Grigore and her sensitive skin require it. When it comes to skin cream, cleanser, toner, makeup remover, and lip balm, Adina believes less isn’t just more, it’s everything. That’s why each S.W. Basics product contains only five ingredients or fewer. S.W. Basics apothecary style glass bottles and jars aren’t watered down and chock full of synthetics, fillers, perfumes and ingredients you can’t pronounce. What they do contain is just a handful of whole high-potency ingredients such as: Shea butter, olive oil, tea tree oil, raw apple cider vinegar, cinnamon, peppermint, or sweet almond oil. Despite its name, the company’s commitment to quality is anything but basic. Even the way Adina and her team source their ingredients is unique. They support sustainable agriculture by using only organic, Fair-Trade, small-farm sources in the USA. What a welcome relief for those with sensitive skin and those who are just plain sensitive to exposing their bodies and the planet to chemicals and preservatives. At S.W. Basics we make truly all-natural, sustainable skincare with only organic, Fair-Trade, or family-farmed ingredients. All of our formulas use only 5 ingredients or less, which make them awesome for people (like us!) with super-sensitive skin. Our thinking is: fewer ingredients means higher potency, less chance for irritation, and a smaller environmental impact. @mimi Hi! They are gluten free but we are not certified. So we encourage people to be safe especially if you have a severe allergy, but we've had gluten-free folks use the products without any problems. As soon as we can get the products tested and become certified, we will! I have very dry skin. What products would you recommend for me? @Susan Hi!! The cream is really great for dry skin, it's super rich and deeply hydrating. Also you can use the makeup remover to cleanse and moisturize your face, it'll correct dryness. Also beware of your current products, which may be drying you out more. Let me know if that helps! @Shannon Vegan vegan vegan! The organic lip balms contain organic beeswax, but the line is completely vegan and certified cruelty-free by Peta. @Adina PETA certifies products as being cruelty free? The same PETA based in Virginia that has a ridiculously high ratio of euthenasias compared to adoptions? The same PETA that drives a euthanasia truck, kills animals, and offloads the carcasses into dumpsters? Quite amazing, but I would be very distrustful of anything PETA says. Too bad, because your products sound very nice. Thanks for your question. 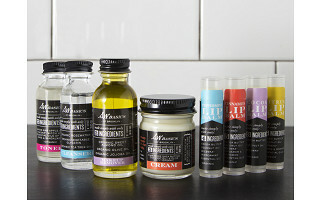 We are selling the mini-kit and the lip balm sets right now. However it includes all of the best selling products such as a 1 oz. bottles of Cleanser, Toner, Makeup Remover, and Face and Body Cream. 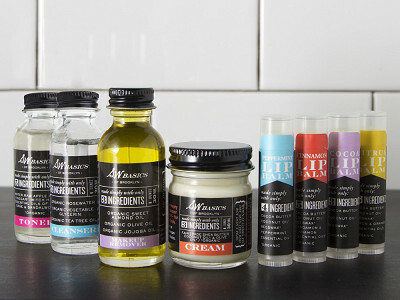 @Amy Will you eventually receive the full line of products for individual purchase? May I ask what you would recommend for a woman over 50 with combination skin? Thank you. S.W. Basics of Brooklyn makes its all-natural skincare and beauty products from scratch because company founder Adina Grigore and her sensitive skin require it. When it comes to skin cream, cleanser, toner, makeup remover, and lip balm, Adina believes less isn’t just more, it’s everything. That’s why each S.W. Basics product contains only five ingredients or fewer. S.W. Basics apothecary style glass bottles and jars aren’t watered down and chock full of synthetics, fillers, perfumes and ingredients you can’t pronounce. What they do contain is just a handful of whole high-potency ingredients such as: Shea butter, olive oil, tea tree oil, raw apple cider vinegar, cinnamon, peppermint, or sweet almond oil. Despite its name, the company’s commitment to quality is anything but basic. Even the way Adina and her team source their ingredients is unique. They support sustainable agriculture by using only organic, Fair-Trade, small-farm sources in the USA.